When I was little, some dude sold my parents a set of fancy dictionaries, along with some hard bound, gold-tooled history books… one of which was titled A History of Black America, parts i, ii, and iii. My mom sat down, once the salesman had left, and paged through the book, and we hung over her shoulders, looking at pictures of warriors with shields, cotton bolls, plantations, and… dead people. … closed the book as my mother abruptly ended our reading. We all kind of stared at each other, horrified. My mother put the books on the shelf… but that one, she put on a much higher shelf. Volume i, ii, and iii weren’t together after that, for quite a few years (which doesn’t mean my helpful taller older sisters didn’t get them down and make me look at the dead people, but…another story, another day). Which kind of makes me both smile and cringe, now. Black history is American history… and America has an historic acquaintance with (addiction to?) violence. It’s not like we should have expected something else, right? The Dactyl Hill Squad doesn’t have a trigger warning, and I wasn’t expecting the murder, when I ran across it. Honestly, knowing that the book is set in 1863 and features brown and black kids, I *should* have been expecting something — this is a book that takes place during an imaginary sideline of the Civil War and there’s a kidnapping attempt almost immediately, so… yeah. But, I somehow… didn’t expect it. I had to set the book down. 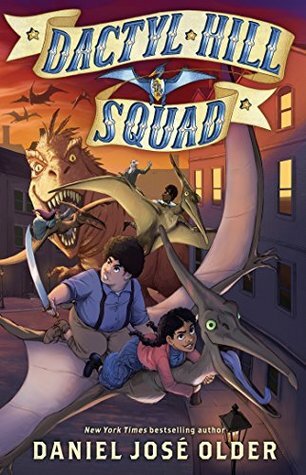 I felt about as ridiculous as the woman who complained to the author in an ill-conceived Twitter comment that the kids on the cover looked “angry.” Um, hello, there’s a ginormous T-Rex behind them, and they’re about to be kidnapped and/or eaten…? This is why we can’t have nice things, honestly. Anyway. Despite my moment of horror and sadness in the beginning, this is a breakneck fast adventure, filled with wisecracks and clapbacks and dinosaurs of all kinds. The existence of dinosaurs in the Civil War era just cracked me up. (I immediately set to imagining antebellum mansions and huge piles of dinopiles. Home improvements!) I love that in this universe there is a Dinoguide and that a very smart girl read it, dreamed of dinosaurs and then took her chance when she found some in real life. This is like a weird version of the Girl Meets Horse story that a lot of us loved when we were kids. I’m kind of thinking that dinosaurs might have improved antebellum EVERYTHING. Chasing down slave ships, leading a prison break, resistance and revolution, chaos and creation, all thanks to one book-savvy, street smart (mostly), determined young lady. In this book, there is realistic sadness, loss, and grief, but with the bitter comes the sweet. This book is bedlam, but also a lot of fun, and I can imagine imaginative middle graders loving it.